Nature trails such as the one pictured above make me want to go for long walks. 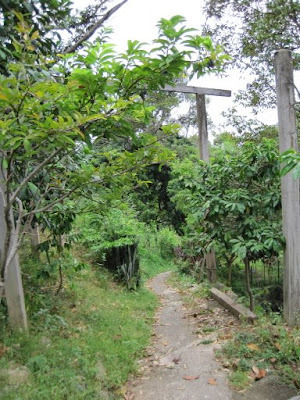 It is a joy to take a path through countryside, along which interesting plants, animals, among others can be seen. When was the last time you got out of the city to enjoy the countryside? When was the last time you reflected on the state of the environment? Do you even care what happens to our green areas? There is nothing better than treading a new path with congenial company and savouring the sense of freedom that it gives us. Equally important, the activity allows us to assess the extent of damage we have inflicted on our natural world, which biologist E.O. Wilson says "is in deep trouble". "Scientists estimate that if habitat conversion and other destructive human activities continue at their present rates, half the species of plants and animals on Earth could be either gone or at least fated for early extinction by the end of the century." I too love going on long nature walks, which i used to do for hours when i was living overseas. During those times, i would walk along the river on a track that would go for miles and miles. I usually walked no more than two hours one way, and then had to turn back for the two-hour return journey. That would take up half a day, and then i would treat myself to a delicious meal in town. The air would be very cool and crisp during non-summer months, which made for a relaxing workout (an oxymoron? ).